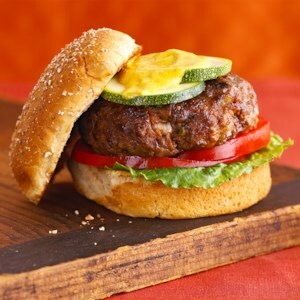 Find healthy, delicious hamburger recipes, from the food and nutrition experts at EatingWell. 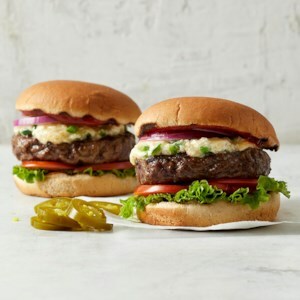 Carrots, scallions, and Italian seasoning are added to ground beef to enhance the flavor in this grilled burger recipe. 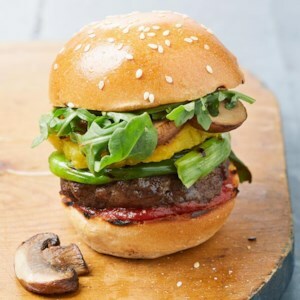 An easy 2-ingredient curry mustard sauce is served on the top of each burger, adding a unique taste. Switch things up by substituting ground turkey or ground chicken for the beef. 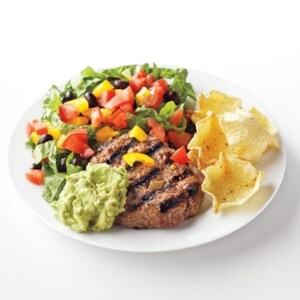 Chopping steak instead of using ground beef to make these healthy burgers gives them a more toothsome texture. Come summer, give this a cooler spin by tossing the raw fennel with 2 tablespoons vinegar and 1 tablespoon oil to serve alongside. 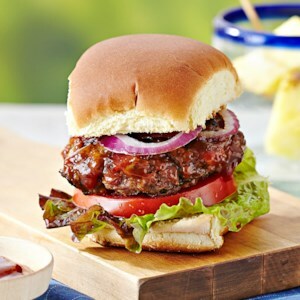 For your next barbecue, try these Hawaiian-inspired sweet and savory burgers. They're made from lean ground beef and have bacon and crushed pineapple baked right in. Served with barbecue sauce on Hawaiian sweet rolls, they're sure to impress your guests. Tacos can be a messy meal but when eaten as a salad with baked tortilla chips, there's less of a mess. 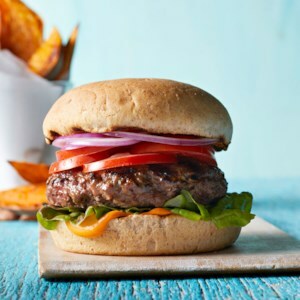 Instead of using cooked and seasoned ground beef, this recipe calls for salsa-flavored burgers. 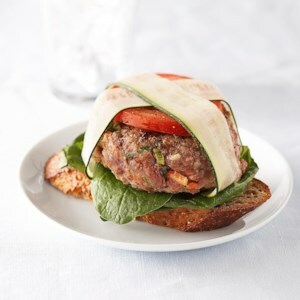 Reach your goal of five a day when you add veggies inside and on top of these juicy burgers. 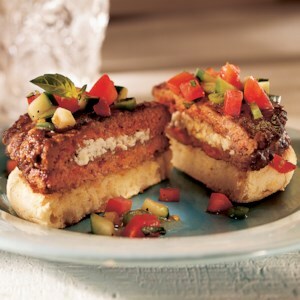 These cheese-stuffed burgers are served on English muffins instead of a bun and topped with a tomato relish instead of ketchup. 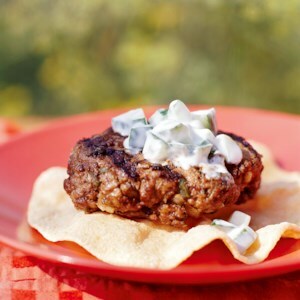 Tame these fiery mint- and cumin-spiked ground beef patties without derailing your daily meal plan when you add the cool low-fat cucumber sauce to them. 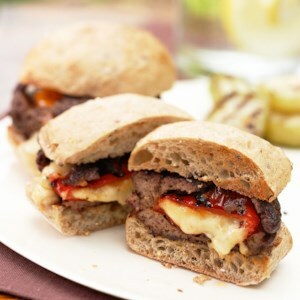 Inside these mesquite-seasoned burgers you'll find roasted sweet peppers oozing with melted pepper cheese. Grill them up for dinner or at a summer cookout with friends. 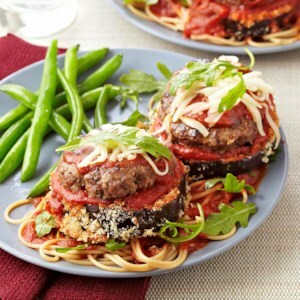 This healthy take on burgers and fries swaps in chopped mushrooms for some of the meat in the burger patties, to cut back on calories and saturated fat. 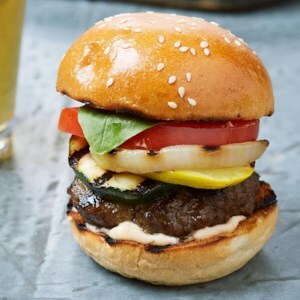 With a touch of sweet from the mango, savory from the bacon, plus a creamy avocado spread, this healthy slider recipe with takes burgers to a whole new level. Double the avocado mayo and use it for your next BLT. 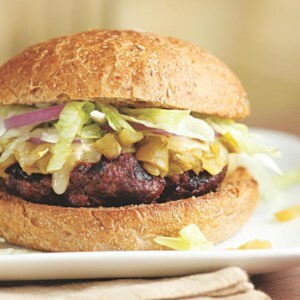 Grilled sweet pineapple and spicy Sriracha ketchup balance each other in this healthy burger recipe. Grill up your veggie haul from the farmers' market and pile them on as toppings in this healthy burger recipe. Bell peppers work well too. Take a trip to the Southwest with this juicy green-chile cheeseburger made with rich-tasting ground bison. You could make these with freshly roasted green chiles, but canned green chiles, which you can find near other Mexican food in most supermarkets, keep this recipe a snap to make when you're in a hurry. Serve with a sliced tomato salad. 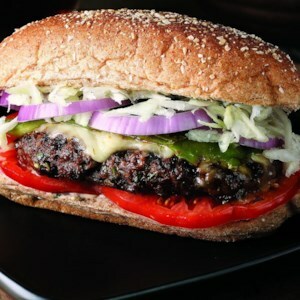 This healthy burger recipe features a spicy fajita burger slathered with a spicy chipotle mayonnaise and topped with roasted Anaheim peppers and a delicious slaw. 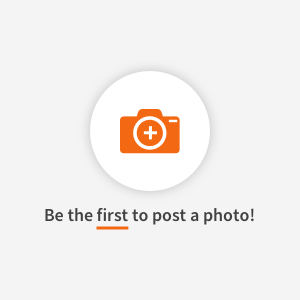 Serve it on an oblong bun. Whole-grain bulgur (cracked parboiled wheat berries) bulks up this healthy burger recipe. Check the bulgur package directions--some brands just need a quick soak in boiling water, while others need to be cooked for up to 15 minutes. Serve with roasted potato wedges and sliced tomatoes. 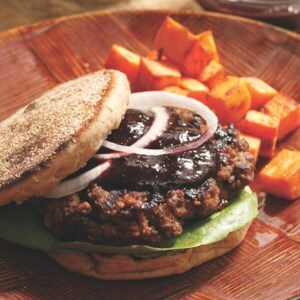 In this healthy burger recipe, dried cherries are mixed into ground beef to reduce fat and increase antioxidants. 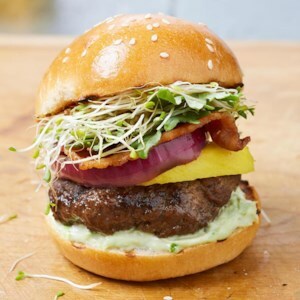 Serve the burgers with your favorite garnishes. And, if you think that ketchup is made only from tomatoes, think again! Tart cherries are simmered in this delicious healthy ketchup recipe to make a fine condiment for just about any poultry or meat. Try the leftover ketchup with grilled chicken or pork, or as a dip with sweet potato fries. Ah, the magic of seared beef! 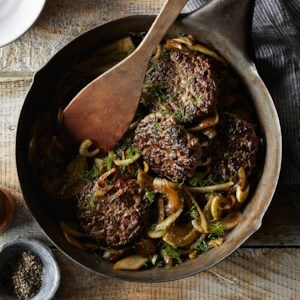 Sauteing the onions with sugar turns them into a meltingly sweet topping to dress up these hearty beef-and-bulgur patties.